Randy Chortkoff of Delta Groove Productions/Records shows off his 2012 BFG during a visit to Delta Groove headquarters in Van Nuys, CA by your BFG editor and Sales Director, Cheryl O'Grady-Yearnshaw. 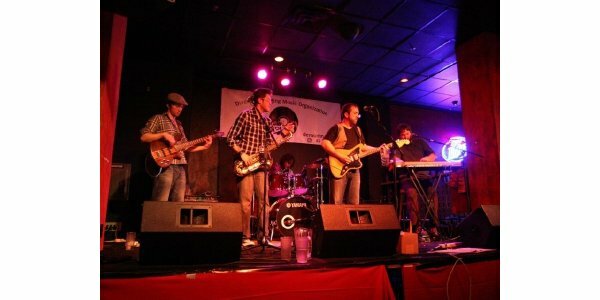 Helping provide the big engine powering the current blues revival are the Delta Flyers led by lead singer and songwriter Stevie DuPree. Formed in Texas as an acoustic duo in 2007, the incendiary Dupree, with music pungent as mesquite barbecue, built a loyal fan base and critical acclaim. Dr. Dupree’s Love Shop with new wingman, guitarist Travis Stephenson, is his breakthrough release. 12 original tunes spotlight Dupree backed by Quentin “Q” Calva (bass), Steve Bundrick (drums), Mark “Kaz” Kazanoff (production, tenor sax, harmonica, background vocals, percussion), Mark Connolly (keyboards), the Texas Horns (Kazanoff, John Mills, Al Gomez) along with guest turns by Derek O’Brien (guitar), Marcia Ball (piano) and vocalists Alice Stewart and Lisa Tingle. The CD includes hook-laden, rocking blues, spicy N’Awlins, sweaty R&B greased by funk and dripping soul, nasty country blues, a thumping, swinging shuffle, a gospel-hued ballad. second line and a classic Motown riff. 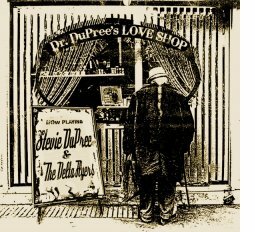 Hop on board this soulful blues train and make a stop at the Dr. Dupree's Love Shop for a dose of good loving and good rocking. Listen to "St. Paul's Bottoms"
Come out and dance the blues with Blues Union (Boston) every Thursday in the beautiful Dance Union studio in Union Square! Every week we provide beginner- and intermediate-level blues classes, as well as two hours of social dancing. On the last Thursday of the month, we hold a Blues Clinic instead of the lessons, where students can work one-on-one with instructors. The floor is beautiful, the vibe is chill, and we always have baked goods. Blues Union also strives to be more than just another lesson and dance venue. We are a community of dancers who are committed to constantly improving ourselves and our students. Through focused group lessons with local and guest instructors, we aim to teach quality lessons focused on improving both beginner and intermediate dancers. Blues Union is also unique in the Boston blues scene, in providing a monthly Blues Clinic, where dancers can receive more individualized feedback to help them truly improve. Blues dancing is a modern name for a family of dances, danced to blues, jazz, and related music. Most dances have a simple, one- or two-step basic. This means that there is less reliance on patterns, and more emphasis on creativity, stye, and partnership. The simplicity of blues dance makes it easy to pick up, and allows for rich variations. The vintage blues dances originated between the late 1800s and the swing era, and the modern revival is still growing the dance today. Below are some common styles of blues. Misha Siegfried went to college, but he maintains that the only thing he was ever really good at was music. And that's nothing to shake a stick at – the guy practically has a Ph.D. in the blues. To interview him is to get a crash course in the philosophy of the genre and to walk away with a comprehensive understanding of its fans' dichotomous schools of thought. "There's the side that says 'This is how we've been doing it for 60 years. It'll never change. This is the blues, and nothing else is.' They want to hear Muddy Waters music exactly the way Muddy played it, even though he's been dead for 30 years," he says. And the opposite point of view? "It's the idea that blues is constantly evolving and that in times like now where the blues is not as culturally relevant as it used to be, it has to continue to grow, evolve and change in order to still be able to contribute to the cultural conversation." So, to which school of thought does Siegfried, who is arguably one of Milwaukee's favorite blues musicians, belong? "As a band leader and in terms of the music I'm interested in making and why I ended up becoming a musician, it was the latter that appealed to me the most," he admits. "Take the germ of the idea, put your own spin on it and push the boundary out." Siegfried has been pushing that boundary for years, since his parents bought him a guitar for his 16th birthday (they were going to buy him a cello, but he begged them not to). Later this month, he and his band will release their second CD, an as-yet-untitled work (the working title "Makin' Wookie" was unfortunately nixed). The album will be the product of heavy collaboration within the group and a profoundly laissez-faire approach to recording which has made Siegfried stand out among other musicians. The band includes Siegfried on guitar and vocals, Dan Budziszewski on keyboard and vocals, Ross Catterton on saxophone and vocals, Zach Steiner on bass and Brandon Anthony on drums. The group met at the Up and Under Pub and were all hired by Siegfried to do last year's record, "Blues For Joy" (though Anthony did not perform on the album). Naplesnews.com - Little Eddie and his crew gave Marco Island a lesson in cooking on Wednesday night (Jan 2). 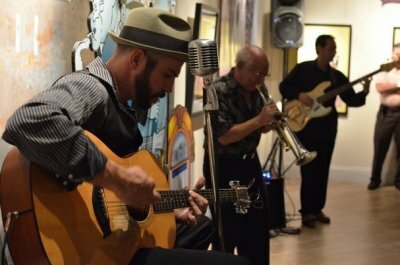 The blues guitarist put on a show of tasty guitar licks, augmented by some well-seasoned musical collaborators, at the opening of "Florida's Got the Blues," a traveling exhibition at the Marco Island Historical Museum. Showing that Marco Islanders have a love of roots music, or that the season is officially underway, or both, the museum gallery was packed with spectators for a two-hour plus performance. "Little Eddie" is the nom de guitar of Ryan Bladen, who often performs with his group, Little Eddie and the Fat Fingers. Wednesday, though, the fingers were his, flying over the fretboard of his beat-up Taylor guitar, as he repeatedly broke strings prying notes out of the instrument with a wrenching, gut-bucket style. 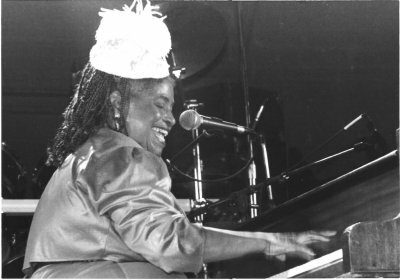 The room was lined with posters, record jackets, and old photographs of bluesmen – and blues women – highlighting the strong connection between the Sunshine State and blues music. Although not considered in the same breath as New Orleans, Chicago, or the Mississippi Delta, Florida lays claim to a lot of the classic performers, including Bo Diddley, Guitar Shorty, Blind Blake, and the great Ray Charles. Marco Island's connection to Ray Charles couldn't be any more direct. The musical legend's first band director and trumpet player, Renald Richard, lives on Marco and was on hand Wednesday night, playing along with Little Eddie on a number of tunes, including the classic "I Got a Woman" (way over town, who's good to me) that Richard co-wrote with Ray. PLAN TO ATTEND THE 2013 INTERNATIONAL BLUES CHALLENGE? 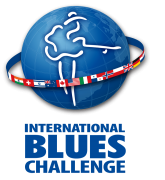 Tickets are available now for the 29th International Blues Challenge (IBC), Tues, Jan 29-Sat, Feb 2, held in Memphis, TN. 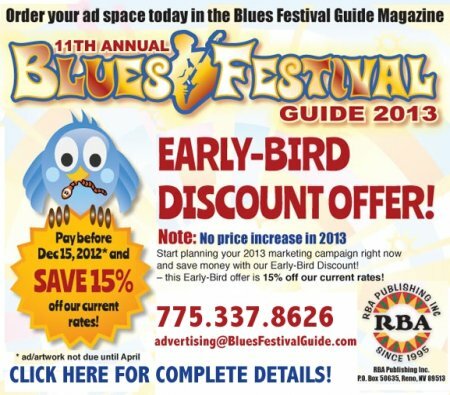 The Blues Foundation has special prices and direct lines and links to a number of Downtown Memphis hotels 2013 IBC. Reserve early! 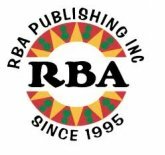 The Keeping The Blues Alive Awards luncheon ceremony on February 1, is also part of the IBC weekend of events. 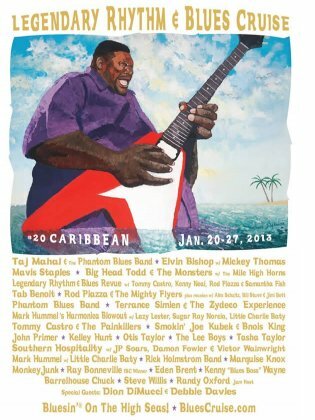 For complete information about the 2013 International Blues Challenge weekend click here. Orders shipped USPS Priority Mail. 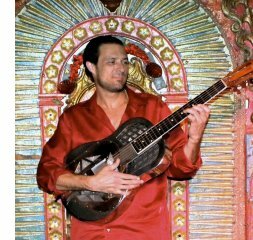 Singer, songwriter, slide guitar virtuoso, one-man-band Ben Powell will represent Blues Lovers United of San Diego (BLUSD) at the International Blues Challenge in Memphis at the end of January. Ben has created a truly unique sound playing his resonator guitars, stomping on a homemade winebox footboard, playing rack-harmonica, and singing his old style blues and his original tunes. BLUSD is celebrating Ben's victory at Humphrey's Backstage Live (Shelter Island Dr., San Diego, CA) on Saturday, January 19 from 1 pm-4:30 pm. Along with Ben Powell, there will be performances by San Diego based artists Red Lotus Revue (who are currently in the final 5 for the IBC's "Best Self Produced CD") and Nathan James & The Rhythm Scratchers (Nathan was the 2007 IBC Duo winner). BLUSD invites everyone to come out and show your love for Ben and help them send him off in style. Admission is only $10 and there will also be raffle prizes. This has been a year in blues music worth remembering, so join Elwood Blues in the BluesMobile as he does just that, and celebrates the Best Blues Artists of 2012. 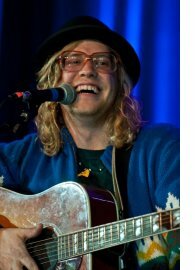 From Allen Stone to ZZ Top, Elwood plays the heavyweights, the young guns, and the torchbearers of blues who made a difference in 2012, such as Joe Walsh, the 24th Street Wailers, Joan Osborne, Dr. John, and many more. 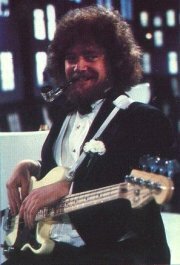 Then, in the second hour of the program… Elwood's good friend and fellow Blues Brother, Duck Dunn, passed through the veil in May of 2012. Join Elwood in a remembrance of this master bass player. Music from Booker T, Otis Redding, Neil Young, and more. 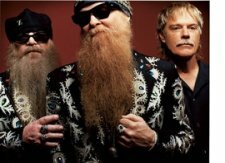 The Best Blues Artists of 2012 PLUS a remembrance of Duck Dunn. Next time, in The BluesMobile. Katie Webster "A Little Meat On The Side"
Our top-ranking blues website, www.BluesFestivalGuide.com, well-known for its comprehensive list of blues festivals throughout the world, has a new FREE feature: Gig/Concert listings to benefit fans, bands, and venues! Find dozens of festivals at www.BluesFestivalGuide PLUS a Blues Link Directory for everything blues: bands, labels, venues, etc.